You’ll find $7.50 in new Target mobile store coupons available today, plus one lonely printable Target coupon and they’ll expires on January 21, 2011. All of these have been added to the Deal Seeking Mom Coupon Database as well. Remember, you can stack Target coupons with manufacturer coupons for even bigger savings! Previous Post: « Atlanta Bread Company: FREE Cookie for Your Birthday! THANKS FOR THE INFO. I ALWAYS SEE CODES FOR THE TEXT ON SITES SUCH AS URS, BUT HOW DO WE REDEEM THE COUPONS? You have to have a phone with internet access. Use the URL that is sent to you via text to view the coupons. 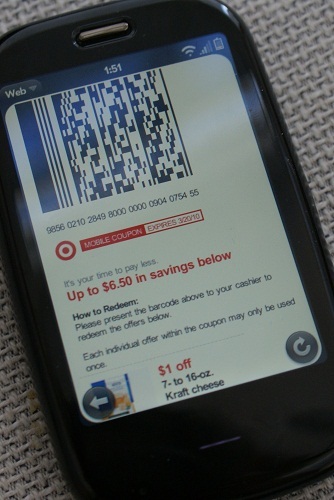 Target will scan the coupon on your phone. You just bring up the text message that Target (or whoever) sends you and the cashier scans the barcode on your phone- super easy!